This setting allows Kiosk Pro to dim and wake itself at a predetermined time. Enabling Night Mode allows Kiosk Pro to dim the iPad's screen to black and temporarily remove response to touch for the time period you designate. For the recommended Night Mode with Dim option included in our Plus and Enterprise versions, Kiosk Pro dims the screen to the minimum possible brightness, sets a plain black background, and disables touch to the screen, giving you control over the times that your kiosk is available for use and conserving power and/or battery life. During this Night Mode with Dim period, the app does NOT turn off the LED backlight completely or put the iPad to sleep. At the scheduled wake time, the app returns the screen to the previously-set brightness level and reloads the homepage, making the kiosk available and ready to use without any staff intervention. When using the Night Mode with Sleep option included in our Enterprise version, the app allows the iPad to enter a true sleep state, turning off the LED backlight completely, which further reduces the power needs of the device. At the scheduled wake time, Kiosk Pro begins pushing notifications to the screen, requiring a staff member or user 'swipe to unlock' the device, at which point the app reloads the homepage and is ready for use. Since push notifications are not compatible with Guided Access or Single App Mode, neither is an option when using Night Mode with Sleep. These challenges mean that, for a majority of projects, Night Mode with Dim is the better option. Scheduling Night Mode consists of sets of matched pairs, Wake and Dim. Wake represents the time that the kiosk returns to normal operations and Dim represents the time that the kiosk dims the screen and disables touch. Each can be filled in with a day of the week and time (using the 24-hour clock system). For example, to wake your kiosk at 9 AM on Monday, you would add Monday 09:00 as your Wake time. Please note that Daily cannot be combined with different times for other days of the week; if you need six days of the week on one schedule and the other day on a different schedule, you will need to program each day separately. Night Mode is based on the iPad's own internal clock; if the time set is inaccurate, this will affect the timing of night mode. Note: If you launch your kiosk presentation during what would otherwise be a scheduled dim period, Kiosk Pro assumes you do not want to enter Night Mode for that period (as it would be potentially confusing to a user to launch the kiosk in a dimmed state) and will wait until the next scheduled dim period to engage. Our Enterprise version allows you to choose whether to allow the iPad to go into a true sleep state or simply dim the screen to black. The Wake and Dim settings tell Kiosk Pro when to schedule Night Mode. Each can be filled in with a day of the week and time (using the 24-hour clock system). For example, for Wake if you enter Tuesday 09:00 and for Dim you enter Monday 17:00, Kiosk Pro will enter Night Mode at 5 PM on Monday, and wake at 9 AM on Tuesday. If you simply need the same hours to run every day, you can use 'Daily' to set a single wake/dim pair that will run each day. For example, if you want your kiosk to be available from 9 AM to 5 PM every day, you would set Wake to Daily 09:00 and Dim to Daily 17:00. Please note that 'Daily' cannot be combined with different times for other days of the week; if you need six days of the week on one schedule and the other day on a different schedule, you will need to program each day separately. Note: If you launch your kiosk presentation during what would otherwise be a scheduled dim/sleep period, Kiosk Pro assumes you do not want to enter Night Mode for that period (as it would be potentially confusing to a user to launch the kiosk in an inactive state) and will wait until the next scheduled dim/sleep period to engage. Note: We do not recommend using true sleep on an iPad running iOS 8 or later, as the lock screen with notifications can potentially allow visitors to escape into other apps. Details below. Entering a true sleep state reduces the power requirements of the iPad and can be ideal for situations where power to a certain building or area is turned off on a regular basis. To schedule sleep, the Dim setting must start with 'Sleep'. For example, Sleep Monday 17:00 or Sleep Daily 17:00. At the scheduled wake time, Kiosk Pro begins to send recurring push notifications to the screen to wake from the sleep cycle. The screen shows the standard unlock screen with the incoming notifications from the app. To fully wake the kiosk, a user must do the standard 'swipe to unlock' gesture. Previous to iOS 10, once the user has swiped to unlock, the device launches automatically into Kiosk Pro - there's no opportunity to go to the home screen or another app. For true sleep, Auto-Lock must be enabled in the iPad's general settings (recommended setting > 2 minutes) and turned Off in Kiosk Pro's settings (under Power Management). Kiosk Pro will then temporarily disable Auto-Lock during wake periods and allow it during a sleep period, allowing the device to achieve a true sleep state. As waking from true sleep requires push notifications to the screen, this type of notification must be allowed when requested through the iOS and is triggered when turning on Night Mode. You can check if Kiosk Pro has the correct permissions by going to iOS Settings > Notifications and checking to see that Kiosk Pro Enterprise is listed and has alert permissions enabled (not just banner permissions). It is not possible for an app to request this type of permission more than once every 24 hours so if you deny the permission when the pop-up is shown initially, the iOS requires that you wait at least 24 hours (or manipulate the date/time settings on the device to simulate such a delay) before it can be triggered again to allow it. Push notifications are not allowed while the device is in Guided Access; if you are using a device running iOS 8 or later, we do not recommend using this true sleep mode (as there is then no way to prevent a user from exiting through the Notifications menu at the top of the screen). 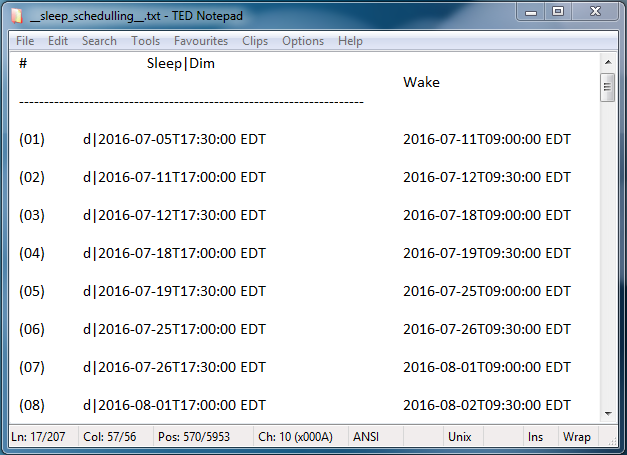 This button, which is placed in the top right of the 'Schedule Night Mode' screen, allows you to generate a file showing the next 50 dim-wake periods based on the schedule currently configured. This can be helpful in confirming that a complex schedule has been set correctly and can be interpreted by the app or used in troubleshooting. The generated text file, '__sleep_schedulling__.txt', is created and stored in the '____com.kioskgroup.application.logs____' folder within the Kiosk Pro documents folder. It can be accessed by syncing the device with iTunes or iMazing or by sending a troubleshooting log to your own email. Sleep/dim and wake times are shown as complete date and timestamps in the timezone set on the device. Sleep periods are marked with an 's' preceeding the timestamp; dim periods are marked with a 'd' as seen in this sample file showing a schedule where the kiosk is configured to be available for use on Mondays from 09:00 to 17:00 and on Tuesdays from 09:30 to 17:30 and dimmed the remainder of the week. This setting was designed specifically to minimize power usage, especially in situations where the iPad kiosk cannot be plugged into an external power source. It allows you to configure how long the screen will sit idle before minimizing brightness to the minimum possible level (and therefore consuming less power). When a visitor touch is detected to the screen, the screen will be returned to the previous brightness level, making the kiosk ready for use by a visitor. This setting lets you choose when the Reduce Screen Brightness setting should apply based on the battery percentage of the device. Reduce Screen Brightness must be set to something other than Never in order for this setting to apply. This power management option allows Kiosk Pro to use the standard iOS Auto-Lock settings to put the device into a sleep state. If this setting is enabled, it will allow Kiosk Pro to respect the Auto-Lock timer settings configured in iOS settings > Display & Brightness > Auto-Lock. If Auto-Lock is set to Never in iOS settings, the device will not go to sleep, regardless of Kiosk Pro settings. Since Auto-Lock cannot be engaged during video playback as it is disabled by the iOS operating system, it is not recommended to use this setting in conjunction with Kiosk Pro's Screensaver setting. In iOS 10, the lock screen was changed from using a slide gesture to unlock the device to pressing the Home button. Since Guided Access disables the Home button, iOS 10 also changed Guided Access so that it disables Auto-Lock. This means that the Enable Auto-Lock feature will not work in conjunction with Guided Access. In this situation, we recommend setting up the device in Single App Mode, which does allow Auto-Lock. If the Home or Power buttons are not accessible to your visitors, there is no way to wake the device without removing it from its enclosure. As a possible alternative in our Plus and Enterprise versions, we also have a setting that allows the device to dim to the minimum possible brightness when idle on the home screen - when a visitor touches the screen it returns to the previously set brightness level. As the screen is still on, this does not result in the same power savings as actually putting the device to sleep using auto-lock, but can extend battery life significantly.